20,000 Leagues Under the Sea is a 1954 American Technicolor adventure film and the first science fiction film shot in CinemaScope. The film was personally produced by Walt Disney through Walt Disney Productions, directed by Richard Fleischer, and stars Kirk Douglas, James Mason, Paul Lukas, and Peter Lorre. It was also the first feature-length Disney film to be distributed by Buena Vista Distribution. The film is adapted from Jules Verne's 19th-century novel Twenty Thousand Leagues Under the Sea. It is considered an early precursor of the steampunk genre. The film was a critical and commercial success, being especially remembered for the fight with a giant squid, and Mason's definitive performance as the charismatic anti-hero Captain Nemo. It won two Academy Awards for Best Art Direction and Best Special Effects. In 1868, rumors of a sea monster attacking ships in the Pacific Ocean have disrupted shipping lanes. The United States invites Professor Pierre M. Aronnax and his assistant, Conseil, onto a Navy expedition to prove the monster's existence. On board with them is the cocky master harpooner Ned Land. After months of searching, the "monster" is spotted shortly before it rams the warship. Ned and Aronnax are thrown overboard, and Conseil goes in after Aronnax. The helpless, crippled frigate drifts away, and no one aboard responds to the overboard passengers. The three find a strange-looking metal vessel, and realize the "monster" is a man-made "submerging boat" that appears deserted. Aronnax finds a large viewport and witnesses an underwater funeral. Ned, Aronnax, and Conseil attempt to leave in their lifeboat, but the submarine crew stops the castaways. The captain introduces himself as Nemo, master of the Nautilus. He returns Ned and Conseil to the deck while offering Aronnax, whom he recognizes for his work, the chance to stay. After Aronnax proves willing to die with his companions, Nemo allows Ned and Conseil to remain. Nemo takes them to the penal colony island of Rura Penthe. Nemo was a prisoner there, as were many of his crew. The prisoners are loading a munitions ship. The Nautilus rams it, destroying its cargo and killing the crew. An anguished Nemo tells Aronnax that his actions have saved thousands from death in war; he also discloses that this "hated nation" tortured his wife and son to death while attempting to force him to reveal the secrets of his work (one of which is implied to be nuclear power). Ned discovers the coordinates of Nemo's secret island base, Vulcania, and releases messages in bottles, hoping somebody will find them. Off the coast of New Guinea, the Nautilus becomes stranded on a reef. Ned is surprised when Nemo allows him to go ashore with Conseil, ostensibly to collect specimens, while strictly admonishing them to stay on the beach. Ned goes off alone to explore avenues of escape. While drinking from a pool, he sees human skulls on stakes. Ned runs for his life and rejoins Conseil, and they row away, pursued by cannibals. Aboard ship, the cannibals are repelled by electrical charges through its hull. Nemo is furious with Ned for disobeying his orders, confining him to the brig. A warship approaches, firing upon Nautilus, which descends into the depths, where it attracts a giant squid. After a similar electric charge fails to repel the monster, Nemo and his men surface during a storm to dislodge it. Nemo is caught in one of its tentacles. Ned, having escaped from captivity, saves Nemo from drowning. Nemo has a change of heart and claims he wants to make peace with the world. As the Nautilus nears Vulcania, Nemo finds the island surrounded by warships whose marines are converging on his base. As Nemo goes ashore, Ned tries to identify himself as the author of the bottled messages. Aronnax is furious, recognizing that Nemo will destroy all evidence of his discoveries. Nemo enters the base and activates a time (atomic) bomb, but is mortally wounded on Nautilus's deck from a slug to the back. After navigating the submarine away from Vulcania, Nemo announces he will be "taking the Nautilus down for the last time". The crew declare they will accompany their captain in death. Aronnax, Conseil, and Ned are confined to their cabins. The Nautilus's crew also retreat to their cabins at Nemo's instructions. Ned escapes and manages to surface the Nautilus, hitting a reef in the process and causing the sub to flood. Nemo staggers to his salon viewport, watching his beloved sea as he dies. Aronnax tries retrieving his detailed journal, but the urgency of their escape obliges Ned to knock him unconscious and carry him out. The three companions and Nemo's pet sea lion, Esmeralda, witness Vulcania explode, and Ned apologizes to Aronnax for hitting him. As the Nautilus disappears beneath the waves, Nemo's last words to Aronnax echo: "There is hope for the future. And when the world is ready for a new and better life, all this will someday come to pass, in God's good time". Dinner aboard the Nautilus. From left to right: James Mason, Kirk Douglas, Peter Lorre, and Paul Lukas. In 1950 Sig Rogell announced he had bought the rights to the novel as well as to an adaptation prepared by Robert L. Lippert's production company. He was going to make the film independently. The rights eventually went to Disney. 20,000 Leagues Under the Sea was filmed at various locations in The Bahamas and Jamaica, with the cave scenes filmed beneath what is now the Xtabi Resort on the cliffs of Negril. Filming began in spring of 1954. Some of the location filming sequences were so complex that they required a technical crew of more than 400 people. The film presented many other challenges, as well. The famous giant squid attack sequence had to be entirely re-shot, as it was originally filmed as taking place at dusk and in a calm sea. [Note 1] The sequence was filmed again, this time taking place at night and during a huge gale, both to increase the drama and to better hide the cables and other mechanical workings of the animatronic squid. With a total (and greatly over-run) production cost of $9 million, the film was the most expensive in Hollywood to that date and presented a serious financial risk to the studio should it flop. The film was also praised for the performances of the leading actors. This was the first time that major international stars such as Kirk Douglas, James Mason, and Peter Lorre had appeared in a Disney film, although Robert Newton, a well-known actor in British films, had played Long John Silver in Disney's Treasure Island (1950), and Richard Todd, another well-known British actor, had appeared in Disney's Technicolor live-action version of The Story of Robin Hood and His Merrie Men (1952). Mason especially was singled out for his performance of Captain Nemo. Many people who had first seen him on-screen in the film identify him most strongly with this role. 20,000 Leagues Under the Sea received positive reviews from critics, was the second highest-grossing film of the year (behind White Christmas), earning $8 million in box office attendance in North America. Modern-day film critic Steve Biodrowski said that the film is "far superior to the majority of genre efforts from the period (or any period, for that matter), with production design and technical effects that have dated hardly at all." Biodrowski also added that the film "may occasionally succumb to some of the problems inherent in the source material (the episodic nature does slow the pace), but the strengths far outweigh the weaknesses, making this one of the greatest science-fiction films ever made." Audiences remember it primarily for its giant-squid battle sequence as well as the Nautilus itself and James Mason's portrayal of Nemo. The film currently holds an 89% approval rating at the review aggregator website Rotten Tomatoes, with the consensus being: "One of Disney's finest live-action adventures, 20,000 Leagues Under the Sea brings Jules Verne's classic sci-fi tale to vivid life, and features an awesome giant squid." The film won two Academy Awards and was nominated for one more. The film's primary art designer, Harper Goff, who designed the Nautilus, was not a member of the Art Directors Union in 1954 and therefore, under a bylaw within the Academy of Motion Pictures, he was unable to receive his Academy Award for Art Direction. Rather than an authentic soundtrack recording of the film's score or dialogue, two vinyl studio cast record albums were released to coincide with the film's first two releases. Both albums contained condensed and heavily altered versions of the film's script without the usage of any of the film's cast for character voices. In addition, both albums were narrated by Ned Land as opposed to Aronnax, who narrated the film and the original novel. Neither album mentioned Nemo as actually being "cracked" (i.e. insane), as the film does, and considerably sanitized the character by omitting any mention of him killing anyone and even having him sing sea chanties with his crew. The albums also had Nemo surviving at the end and releasing Ned, Arronax, and Conseil out of gratitude for their saving his life. In this version, Ned, Aronnax and Conseil were not shipwrecked because the Nautilus rammed the ship they were on, but because a hurricane came up. The first album was issued in 1954 in conjunction with the film's original release, and starred William Redfield as the voice of Ned. This album, a book-and-record set, was issued as part of RCA Victor's Little Nipper series on two 45-RPM records. [better source needed] The second album, released by Disneyland Records in 1963 in conjunction with the film's first re-release, was issued on one 33​1⁄3 RPM 12-inch LP with no accompanying booklet and no liner notes – the usual practice with most Disneyland label albums. It contained much more of the film's plot, but with many of the same alterations as the first album, so this recording was technically a remake of the earlier one. The cast for the 1963 album was uncredited. Neither album listed the film's credits or made any mention of the film's cast. A single for the film's most memorable song "A Whale of a Tale", written by Norman Gimbel and Al Hoffman and sung by Kirk Douglas, was also released in 1954 under the Decca Children's Series label. The song "And the Moon Grew Brighter and Brighter", which Douglas had sung in the movie Man Without a Star (written by Lou Singer and Jimmy Kennedy), was the B-side. Both songs can be found on the 2008 digital release of the film's soundtrack. In the film, Johann Sebastian Bach's Toccata and Fugue in D minor is played by Nemo on the Nautilus's organ, but James Mason's playing is actually dubbed by an anonymous organist. On January 29, 2008, Walt Disney Records released a 26-track digital album containing the music of Paul Smith's original soundtrack score to 20,000 Leagues Under the Sea plus both sides of the "A Whale of a Tale" single, as well as a digital booklet companion that explores the music of the film. This was the first official release of the film score and was initially available only through the iTunes Store. Intrada released the same soundtrack on CD in 2011. Disneyland used the original sets as a walk-through attraction from 1955 to 1966. Walt Disney World Resort's Magic Kingdom also had a dark ride named 20,000 Leagues Under the Sea: Submarine Voyage from 1971 to 1994 which consisted of a submarine ride, complete with the giant squid attack, and an arrangement of the main theme from the 1954 film playing on Captain Nemo's organ in the background. For this ride, voice artist Peter Renaday stood in for James Mason in the role of Captain Nemo. In 1994, a walkthrough attraction at Disneyland Paris, named Les Mystères du Nautilus, opened, and a dark ride at Tokyo DisneySea was created in 2001. The exterior to The Little Mermaid: Ariel's Undersea Adventure contains a silhouette of the Nautilus in a rock wall and the tiki bar Trader Sam's Grog Grotto at Disney's Polynesian Village Resort serves a cocktail called the "Nautilus" which is itself served in a stylized drinking vessel resembling the submarine, and features a dive helmet and a mechanical squid tentacle that pours liquor behind the bar. The film has been released on VHS and DVD. An HD version was released on iTunes. On January 6, 2009, Variety reported that a remake titled 20,000 Leagues Under the Sea: Captain Nemo was being planned with Joseph McGinty Nichol, known as "McG", attached to direct. The film serves as an origin story for the central character, Captain Nemo, as he builds his warship, the Nautilus. McG has remarked that it will be "much more in keeping with the spirit of the novel" than Richard Fleischer's film, in which it will reveal "what Aronnax is up to and the becoming of Captain Nemo, and how the man became at war with war itself." It was written by Bill Marsilli, with Justin Marks and Randall Wallace brought in to do rewrites. The film was to be produced by Sean Bailey with McG's Wonderland Sound and Vision. McG once suggested that he wanted Will Smith for the Captain Nemo role, but he has reportedly turned down the part. As a second possible choice, McG had mentioned Sam Worthington, whom he worked with on Terminator Salvation, though they did not ever discuss it seriously. The project was later shelved in November 2009 with McG backing out of directing. During the 2010 San Diego Comic-Con, director David Fincher announced plans of directing 20,000 Leagues Under the Sea for Walt Disney Pictures based on a script by Scott Z. Burns. While Fincher was wrapping up The Girl with the Dragon Tattoo (2011), it was speculated that 20,000 Leagues Under the Sea would enter principal photography by late 2012. In the meantime, Fincher began courting Brad Pitt to play the role of Ned Land while the film was kept on hold. However, in February 2013, it was announced that Pitt had officially turned down the role. In April 2013, it was announced that the Australian government will provide a one-off incentive of $20 million in order to secure the production. Despite this, the film was put on hold again the following month due to complications in casting a lead. On July 17, 2013, Fincher dropped out of the film to direct the adaptation of Gone Girl. Fincher revealed in an interview that he left the film because he wanted Channing Tatum for Ned Land, but Disney wanted Chris Hemsworth for the role. Additionally, the money originally allocated for the production of this film was redirected towards Pirates of the Caribbean: Dead Men Tell No Tales. In February 2016, Disney announced that it was planning a film titled Captain Nemo, with James Mangold directing. ^ Footage of the original, rejected giant squid attack sequence shows details of the filming. ^ "Walt Disney filmography." Film Reference. Retrieved: January 9, 2015. ^ Higham, William. "What The Hell Is Steampunk?" Huffington Post, February 17, 2012. Retrieved: February 15, 2012. ^ " Home » Program » The Reel Thing XXVII: Program Abstracts The Reel Thing XXVII: Program Abstracts" Reel Thing, July 8, 2011. Retrieved: April 4, 2018. ^ "Overview: '20,000 Leagues Under the Sea'." Solar Navigator (Max Energy Limited), 2013. Retrieved: January 9, 2015. ^ "Overview: '20,000 Leagues Under the Sea'." Eccentric Cinema, May 26, 2003. Retrieved: January 9, 2015. ^ "All Time Domestic Champs." Variety, January 6, 1960, p. 34. ^ "The CinemaScope Wing 3." Widescreen Museum. Retrieved: January 9, 2015. ^ "More Golden Age Classics: 20,000 Leagues Under the Sea." Kidde Records, July 15, 2011. Retrieved: May 31, 2013. ^ "Walt Disney's 20,000 Leagues Under the Sea (Little Nipper Story Book Album)." Amazon. Retrieved: January 9, 2015. ^ "Label: Disneyland Records." Rate Your Music. Retrieved: January 9, 2015. ^ a b "Soundtrack Details: '20,000 Leagues Under the Sea'." Soundtrack Collector. Retrieved: January 9, 2015. ^ "Soundtrack: '20,000 Leagues Under the Sea' by Various Artists." iTunes Store. Retrieved: January 9, 2015. ^ "Soundtrack Details: '20,000 Leagues Under the Sea'." Intrada. Retrieved: January 9, 2015. ^ "20,000 Leagues Under the Sea". 20K Ride. Retrieved January 9, 2015. ^ "Les Mystères du Nautilus". Photos Magiques. Retrieved January 9, 2015. ^ Wilson, Shellie (June 10, 2012). "Review: Tokyo Disneyland and DisneySea – Part 2: Tokyo DisneySea". Craft Gossip. Retrieved January 9, 2015. ^ Sanders, Savannah (April 20, 2016). "Walt Disney World Relics and Tributes: The Magic Kingdom". TouringPlans.com. Retrieved February 24, 2019. ^ "Trader Sam's Grog Grotto menu". Disney World. Disney. Retrieved February 24, 2019. 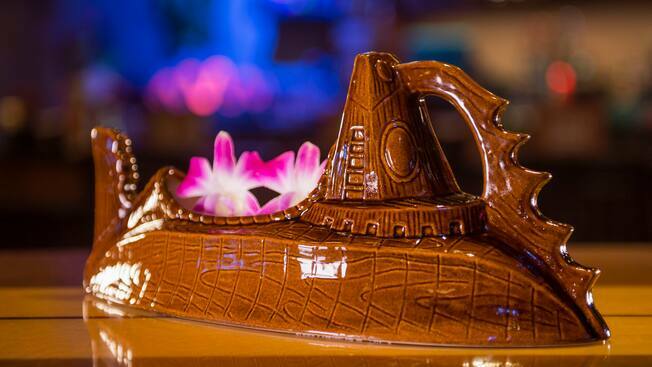 ^ "Trader Sam's Nautilus cocktail vessel". secure.cdn1.wdpromedia.com. ^ Fillmen, Travis (March 29, 2015). "Trader Sam's Grog Grotto: Drinking You 20,000 Leagues Under The Table". Central Florida Aquarium Society. Retrieved February 24, 2019. ^ "20,000 Leagues Under The Sea - iTunes HD Review - Not on Blu-ray". Not on Blu-ray. ^ "Dell Four Color #614". Grand Comics Database. ^ Graser, Marc. "Justin Marks rewriting 'Nemo'." Variety, February 11, 2009. ^ Vejvoda, Jim. "Finding McG's Nemo." Archived February 21, 2009, at the Wayback Machine IGN, January 15, 2009. Retrieved: January 9, 2015. ^ Morris, Clint. "Exclusive: Sam downplays 'Nemo'." Archived June 26, 2010, at the Wayback Machine Moviehole.net, August 21, 2009. Retrieved: January 9, 2015. ^ Goldman, Eric. "McG Talks T5." Archived August 10, 2009, at the Wayback Machine IGN, August 7, 2009. Retrieved: January 9, 2015. ^ Davis, Edward. "Sony Officially Plans To Make 'Dragon Tattoo' Sequels, But David Fincher Is Looking To Direct '20,000 Leagues' Instead." Archived June 5, 2013, at the Wayback Machine IndieWire, January 9, 2012. Retrieved: January 9, 2015. ^ Bullbeck, Pip. "Disney’s ‘20,000 Leagues Under the Sea’ Confirmed For Australia Shoot'." The Hollywood Reporter, April 2, 2013. Retrieved: January 9, 2015. ^ Child, Ben. "20,000 Leagues Under the Sea remake put on hold." The Guardian, May 20, 2013. Retrieved: January 9, 2015. ^ Davis, Edwatd. "Exclusive: Andrew Kevin Walker Rewriting ‘Dragon Tattoo’ Sequel; David Fincher's ‘20,000 Leagues’ Is Dead." Archived July 20, 2013, at the Wayback Machine IndieWire, July 17, 2013. Retrieved: January 9, 2015. ^ Jagernauth, Kevin. "David Fincher Says Differences Over Casting And Disney's Corporate Culture Stalled '20,000 Leagues Under The Sea'." Archived September 18, 2014, at the Wayback Machine Indie Wire, September 15, 2014. Retrieved: January 9, 2015. ^ Jagernauth, Jenkins. "David Fincher." Archived April 15, 2015, at the Wayback Machine Indie Wire, September 16, 2014. Retrieved: January 9, 2015. ^ Ford, Rebecca (February 25, 2016). "'Wolverine' Helmer James Mangold to Direct Disney's 'Captain Nemo'". The Hollywood Reporter. Schickel, Richard. The Disney Version: The Life, Times, Art and Commerce of Walt Disney (Third ed.). Chicago: Ivan R. Dee, 1997. ISBN 978-1-56663-158-7. Warren, Bill. Keep Watching the Skies: American Science Fiction Films of the Fifties, 21st Century Edition. Jefferson, North Carolina: McFarland & Company, 2009 (First Edition 1982). ISBN 0-89950-032-3. Wikimedia Commons has media related to 20,000 Leagues Under the Sea (1954 film).